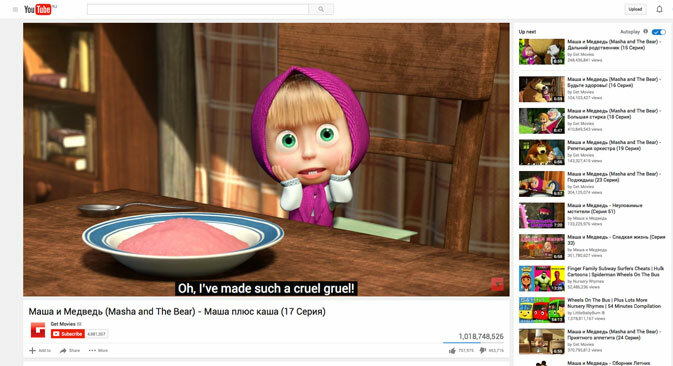 A popular episode from Russian children's animation series "Masha and the Bear" has been viewed more than a billion times on YouTube. A total of 1.02 billion people - at the time of writing - had watched “Recipe For Disaster” on the video platform, the first time a Russian film has broken the billion barrier. Producers, ANIMACCORD studio has launched a third season of the famous series, which has sold to broadcasters worldwide. “Masha and the Bear” is the only Russian cartoon to have become a prizewinner of American Kidscreen Awards in the Creative Talent category. American Animation Magazine has included the series in a list of projects with the potential to become classics of the future.